Product prices and availability are accurate as of 2019-04-22 02:18:44 UTC and are subject to change. Any price and availability information displayed on http://www.amazon.co.uk/ at the time of purchase will apply to the purchase of this product. Easy to clean, easy to use. Coupled with frothy milk you can easily make cappuccino! 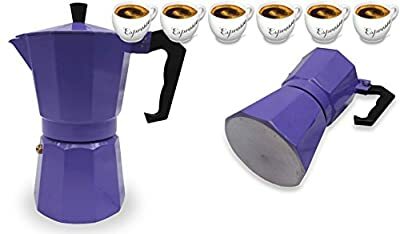 Stovetop espresso maker produces rich, authentic Italian coffee in just minutes. The aluminium pot features distinctive 8-sided design for optimal performance. This polished aluminium traditional continental steam-infusion espresso maker will make the perfect espresso any time. A popular and traditional design ensures that you will achieve that irresistible percolated coffee taste every time. 6 cups / 300ml / 10oz / Top/Base Diameter: 9cm Height: 21cm. NOT for use on induction hobs. Comes in a box.